Our latest update has been released, and with it brings new Field Bosses, new Boss Gear and a way to enhance your Asula’s Crimson Eye accessories! Check out all the information below! Red Nose, Dastard Bheg, Giant Mudster and Dim Tree Spirit have all been added as Field Bosses. Through their ties to the dark energy that permeates through the Black Desert world, these monsters have received a significant power boost and now pose an incredible threat to the citizens of the world. Help take them down and you will be rewarded handsomely for your efforts. With the field bosses, we have also added the chance to collect the powerful Boss Armors. Red Nose’s Armor, Bheg’s Gloves, Muskan’s Shoes, Giath’s Helmet and Dim Tree Spirit’s Armor are all now available as drops when facing off against these bosses. Boss Gear can be obtained after defeating those bosses through either Field Boss fights, or Black Spirit summon scrolls (cannot be obtained through story scrolls). This update will also allow you to enhance the Asula’s Crimson Eye Accessory set. Enhancing Asula’s accessories is similar to enhancing other accessory sets, however you will require the Asula's Weakened Accessory for the enhancement to work. If the enhancement fails, the items will be destroyed. 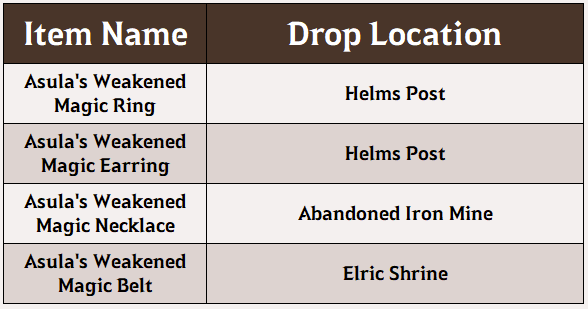 Although rare, it is possible for enhanced Asula’s Accessories (up to TET) to appear in drops. - Asula's Weakened Magic Accessory can be used for Asula's Crimson Eye Accessory enhancement material. You can exchange Asula’s Weakened Magic Accessories for an Asula’s Crimson Eye Accessory or Asula’s Crimson Eye Accessories for Asula’s Weakened Magic Accessories. You can do this by talking to Tariff’s Yisar Pjetyo or Altinova’s Belgar (NPC’s). ●3 Asula’s Weakened Magic Accessories can be exchanged for the same type of Asula’s Crimson Eye Accessory. ●1 Asula’s Weakened Magic Accessory can be exchanged for another Asula’s Weakened Magic Accessory. ● 1 Asula’s Crimson Eye Accessory can be exchanged for 2 of the same Asula’s Weakened Magic Accessories. 1. Fixed an issue where a summoned Red Nose could attack another user's Red Nose. 2. Fixed an issue where the tutorial continues even after the tutorial has been completed. 3. Fixed an issue where Pearl Boxes would get stuck in the Warehouse. 4. Fixed an issue with the ‘Skip Enhancement Animation’. 5. Fixed an issue where the production notes would not appear. 6. Fixed an issue where Guild Allowance could not be distributed to members of a guild. 7. [Event] Enhancement Help Kit now contains 5 Valks Cry. 8. Corrected the time of the Hot Time event to match the event image. 9. Fixed an issue where Asula’s Accessories were not dropping in the Mediah Region.